West Ham manager Slaven Bilic says he did not want Stewart Downing to leave the Hammers and that he was counting on the winger "big time" for next season. England international Downing, 30, has rejoined hometown club Middlesbrough on a four-year deal. "I didn't want him to go, he's a quality English player and I know how hard it is to get the quality ones," said Bilic. Middlesbrough-born Downing spent two seasons at Upton Park, making 74 appearances and scoring seven goals for the Hammers. Capped 35 times by England, Downing left the Riverside for Aston Villa in July 2009, before moving to Liverpool. Stewart Downing won the last of his 35 caps for England in November 2014. He was in the squads for the 2006 World Cup and the 2012 European Championships. 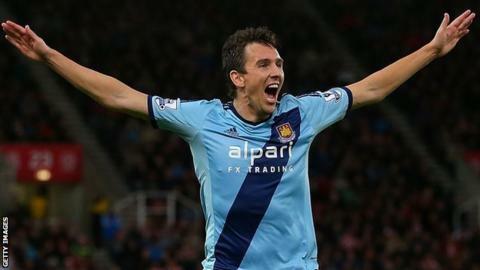 He joined West Ham for £5m in August 2013, his last England appearance against Scotland in a friendly last November. "I know him from the national team when we played England, and he was brilliant in the first half of last season," added former Croatia manager Bilic. "He said 'I like you and everything, but I want to go home. If it was any other club, I would stay here'. Meanwhile, Bilic said he was relieved after James Tomkins scored a 90th-minute winner against Birkirkara in the Europa League second qualifying round first leg at Upton Park on Thursday. The Hammers travel to Malta for the return leg on 23 July with a narrow 1-0 advantage. "We are well organised and are working hard for each other, but in the last third of the pitch, well, there you need some extra quality," he said. "It is not job done, of course. "They will probably play the same way in Malta, and will wait again for some long ball, some mistake or counter-attack, but we are quietly confident."